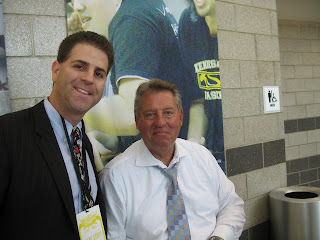 Brad meets the King of Leadership, John Maxwell! June 4th-6th, Cobb County School District hosted their Annual Leadership Institute. The Keynote speaker this year was John Maxwell, author of several books including The 21 Indispensable Qualities of a Leader, 360 Degrees, The Difference Maker, and many more. John’s speech on Leadership hit home to many of the themes I speak about. It was neat to see we were thinking along the same lines. Cobb also gathered some of their biggest leaders including Senator Johnny Isakson to speak on leadership. Later in the conference, I also presented a session I titled, Front of the Class, and Celebrating Abilities and Winning the Game of Life.